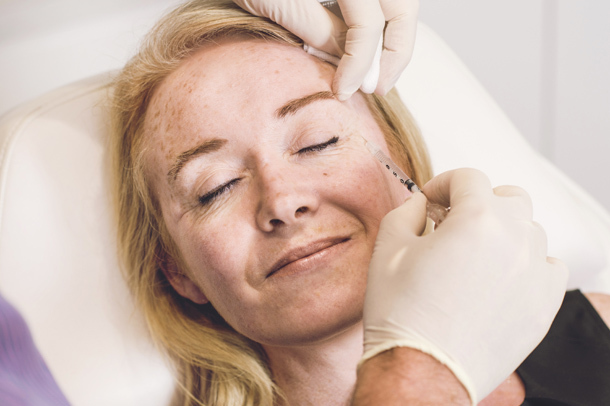 We include Anti Wrinkle Injections in our Age Prevention and Anti-Ageing solutions we can assure you that Dr Gerry Burns will look after you at our specialist Anti-Wrinkle Injection Belfast clinic. At your initial Anti-Wrinkle Injection consultation, we will discuss all treatment options available to you including Anti-wrinkle injections. As they are such a quick and relatively painless procedure, many millions of men and women in the Worldwide choose Anti-wrinkle injections to produce undeniable results. *Anti Wrinkle Injections are also a highly effective treatment for excessive underarm perspiration (hyperhidrosis). Who will benefit from Anti-Wrinkle Injections? Our Anti-wrinkle injections will give especially good results with wrinkles on your forehead & brow, between your eyes or to the sides of your eyes (crows feet). Are Anti Wrinkle Injections treatment safe? Botulinum Toxin has an excellent safety record, being used successfully in medical procedures for adults & children for over 30 years. Administered cosmetically by a qualified medical professional, it will only affect the intended facial muscle or sweat glands. We have extensive experience with Anti-wrinkle injections in our Belfast clinic. It can take about 2-14 days to see the full effects after the initial treatment at our Belfast clinic. 3 – 4 months is most common, although sometimes longer. We offer all our patients the opportunity for a free 2 week follow up appointment to assess the effect of treatment & administer any top up treatments if necessary. Anti-Wrinkle Injections are relatively painless, with perhaps a little discomfort during the procedure and only mild localised tenderness. Any mild swelling or gentle bruising at the injection site should subside within 48 hours. True side effects are extremely rare, but as with any medicine an allergic reaction may occur or occasionally a treatment may relax nearby muscle groups, causing temporary drooping of eyebrow or eyelid that may last only a few weeks. How often can I have Anti-Wrinkle Injections? 3 monthly intervals will sustain results in an area. Other areas can be treated within these intervals at no risk. Will I still have expression in my face? Our anti wrinkle injections treatments are designed to smooth dynamic wrinkles, they do not affect your facial expression. The final result can be tailored to you and can be discussed at the initial free consultation. When should you not have this treatment? The proposed injection site is infected. You are allergic to Botulinum toxin type A injections. You are under the age of 18 years. You have a muscle problem or chronic diseases affecting the muscles. – Those who have blood clotting disorders such as Haemophilia, or take anticoagulant medicines such as Warfarin, Heparin, Aspirin and Anti-Inflammatory medicines. Certain herbal remedies such as Gingiko Bilboa, St John’s Wort and Vitamin E. As there is an increased risk of bruising post procedure. – Those with excessive weakness or wasting in the muscle to be injected – a history of Stroke or Bell’s palsy. – People with chronic breathing problems. Following Anti-Wrinkle Injections, you should stay upright for 4 hours, avoid rubbing or touching the injected areas and avoid having facials and massage for 48 hours, this is to ensure that the treatment remains at the site of injection. Also avoid vigorous exercise for 48 hours. If bruising develops the you can apply Arnica cream and Paracetamol can be taken for mild post procedure pain.